I know it’s not Sunday, but I posted non-fiction yesterday, so I’m plunging into the deep end with some fiction today. He was lost before the music ended. Her delicate, but not fragile, hand disappeared in his, starting the nerves tingling all the way up his arm. His other hand covered over half of the small of her back, the warmth of which raised his heart rate to a level he hadn’t felt recently save in combat. Even worse, the crush of the dance floor drew them closer together than was truly proper; although the joyousness of the celebration cancelled the affront, it didn’t relieve the chaos swirling through him as they were inexorably pushed chest-to-chest by the crush. For his own sanity, and to have any hope of talking to this vision, finding out her name before she disappeared back into the dreamland from whence she came, he leaned down to her ear, savoring the excuse to inhale the spicy-sweet fragrance of her, “Let’s go outside for some air.” She tipped up on her toes to answer, “Yes, please,” totally unaware of what her sweet, warm breath on his face was doing to him. For several years, I have followed Blogenspiel, written by Another Damned Medievalist, whom I will call ADM. Many of you know that I am also a medievalist. A couple months ago, ADM wrote this heartfelt postabout why so many academics, especially women, put up with second-class citizenship, musing that we female academics were PGGs, Professional Good Girls.In one those wonderful serendipitous events, Lena Corazon wrote a wonderfully sensitive post earlier this week, on her loneliness growing up and why finding the online writing community was such a tall drink of water to a parched throat. I have only known Lena since July when we both joined Round Three of the Round of Words in 80 Days, but she and I connected quickly. We are both academics who have written creative works for years, but have only recently gone public as creative writers. The two posts struck chords: Lena’s stirring memories of my early schooling through graduate school, and ADM’s describing both graduate school and work life. ADM posits that Professional Good Girls had a common trait of not finding love and acceptance at home, but rather at school. I certainly fit that model. I was the youngest child in my family, the “oops” child. Although only recently diagnosed, my mother has suffered from depression since before I was born. My earliest memories are of her sleeping on the couch all day while my father was at work and my siblings at school. My father had a very difficult childhood and did not know how to react to children, so although he was there in the evenings, he was distant and withdrawn. I spent most of my time alone, as my siblings were several years older. My sister who is nearest in age has described me as a faery child, who lived in her own imagined world. I found the yearned-for approbation and love at school among my teachers, although my creative efforts got me in trouble throughout school. I made up fantastic stories in first grade; my teacher called my parents to tell them I needed a psychiatrist. I wrote a story for a creative writing course in sophomore year of high school; my English teacher called me parents to tell them that I needed a psychiatrist. My parents didn’t believe in psychiatry; I have often wondered if I would have been better off if they had. As long as I followed the rules, my teachers liked me, so I learned quickly to conform, to be a Good Girl. I was not so lucky with my fellow students. I was a very small, sickly child, so I could not run, skip rope, or play the games that were popular in the early grades. n fourth grade, I had a strep infection that attacked my kidneys, so I was out of school for the entire spring, which made me more of a cypher to my classmates. Although my teachers liked me, their attention made me more a target at times. My first-grade teacher found I could already read, so she had me read to the class while she went to the teachers’ lounge. Her actions led to my being threatened with beatings on the playground. My sixth-grade teacher announced my IQ to the class, making me more unwelcome among my peers than I had already managed to make myself. After that time, I took a blanket and a book to school, reading on the grass alone in a far corner of the playground during lunchtime. High school, with all its concomitant social machinations, was sheer hell. Although I was an attractive girl, no one dated the brain. At best, the boys saw me as someone to help with homework, or worse, to offer advice on how to get the girls they liked to go out with them. I was beneath the notice of the popular girls; my one friend and I spent all our time together, in the unbreakable bubble that surrounded us. When my friend found a boyfriend t the end of sophomore year and abandoned me for him, as often happened in those situations, I was bereft. I did continue to receive love and approbation from most of my teachers, and put my lonely nights and weekends to learning even more. Actually, my loneliness helped me to leave high school early, as I took enough courses to have all my requirements for college by the end of my junior year. I went to a very small college, where I really bloomed as a scholar. My personal life was not going as well. After my sophomore year, I had dated perhaps 6 or 7 young men; only one had ever asked me out more than once. Feeling that no one else would ever be interested in me, I married him. My marriage worked on exactly the same lines as being a Professional Good Girl: do whatever I was told, never question authority, never rock the boat, never stand out in anyway. My ex-husband was also very young; he did not know any better, so he constructed and maintained the box in which my soul and personality was locked away. I became a chameleon, without opinions of my own. I mastered quickly the ability to find out others’ thoughts and reflected them. When we divorced four years later, I realized that I did not know what music I liked, what books I enjoyed reading, or what foods I liked to eat. I knew how to be a scholar, but I had to learn how to be a person. All of this training made me the perfect candidate to became a Professional Good Girl; I will give you my thoughts on graduate school and my work life in another post. 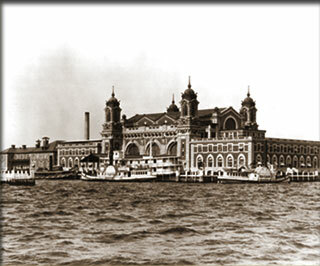 On this day in 1954, Ellis Island closed its doors, although it had not been the federal immigration center for 30 years. From 1892 to 1924, immigrants to the United States through New York harbour had filed through its corridors, been checked for infectious diseases and mental problems; and then, if lucky, were released into the streets of New York. I have not visited the Ellis Island museum, although I suspect walking through it would give rise to hundreds of stories. I cannot imagine waiting in the grand hall for hours, much less the days or weeks it would take before a family member was released from quarantine. These photographs are taken from the tour on Scholastic’s teachers site; although the text is for 4th- or 5th- graders, and rightly so, the pictures are powerful in themselves. 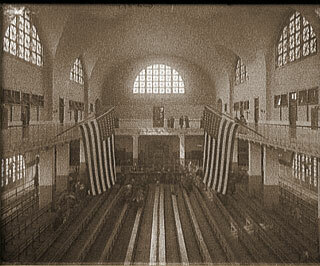 It is very strange to think that only my paternal grandmother went through Ellis Island; to be honest, I am not even sure of that, although it seems likely. The early life of my grandmother is largely unknown, which seems odd in modern times. Last week, the social worker who is helping my parents with assisted living asked my three siblings and myself for the history of my grandparents. I was appalled at how little we knew about my paternal grandmother. The historical record is all too brief, and honestly, seems to have a bit of the Irish blarney attached to it. One day in the 1890’s, a ship docked at Ellis Island from Cobh, Ireland. As the families filed out, there was a little girl who seemed to be alone. She was about 3 or 4 years old, and had no family with her. She only knew her first name, but left Ellis Island with a brand-new, patently made-up last name, O’Smith (oh, that’s very Irish). The story goes that she had a piece of paper with the name and New York address of a first cousin pinned to her dress, and that he raised her as his own. I have several problems with this story. First, how does a 3-year-old get on a ship in Cobh? If her parent or parents died on board, wouldn’t the ship’s captain or purser know about it? Would the officials on Ellis Island really just send a little girl off to the address given on a paper pinned to her dress? And if this address is that of a first cousin, why didn’t he give her either his own name or restore her original one? According to what we know, she did grow up in New York with her first cousin’s daughters, and she kept the made-up name of O’Smith until she married my grandfather. No one knows how old she was when she died in 1947, having taken to her bed several years before when she gave birth to a Downs syndrome child. It was whispered that the root cause was alcoholism, but no one knows much of anything about her life. How can someone living less than 100 years ago, who married and had six children, be such a mystery? Her story draws the writer in me; I want to know what she felt, dreamt, loved, lived. I have always been fascinated with history, of a place, of a family, of a person. My grandmother’s story would have to be fiction, but it is a story I am itching to write. Do any of you have mysteries in, or mysterious members of, your family? What are your stories?